It was only a matter of time before I got around to reviewing my favourite graphic novel, and here it is with Batman: Under The Red Hood. Written by Judd Winick and drawn by Jeff Loeb, the story is centred on the conflict between Batman and Red Hood. The comic was adapted into a successful animated film, but there’s something more visceral about seeing it on the page. The story begins with a brutal fight between Batman and Red Hood, seen through the eyes of a homeless man called David ‘Tipper’ Coates. This is very telling, as street life is one of the biggest themes of the arc. It shifts to Batman’s perspective as he contemplates how prepared his opponent is as they beat each other into the ground. The scene ends with both of them removing their masks and the timeline receding to five weeks in the past. Red Hood has arrived in Gotham and he’s making moves to dismantle Black Mask’s operation through controlling the drug trade. One of his most iconic scenes in throwing a bag full of severed heads onto a table surrounded by crime lords and strongarming them into working for him. Meanwhile, Batman and Nightwing break up a weapons shipment, where they encounter Red Hood for the first time. He manages to get away from them, and it’s implied he set the whole thing up in order to grab their attention. Red Hood also makes his presence felt when he hijacks a shipment of Kryptonite and sets up a deal with Black Mask and Mr Freeze. Batman and Nightwing arrive and it’s shown Red Hood was messing with them again. Later, Red Hood finds The Joker at an abandoned fun fair. He beats Joker viciously with a crowbar until he’s lying in a pool of blood. Then, he takes off his helmet and reveals himself as Jason Todd, the second Robin. This is my favourite sequence in the comic because it mirrors Jason’s death when The Joker attacked him with a crowbar in A Death In The Family. Batman is investigating the Red Hood’s origin, which takes him to Metropolis and Star City. He returns to Gotham and the scene returns to the main fight at the start of the comic. Jason shows himself to Bruce in an emotionally charged exchange, with the former Boy Wonder vowing he’ll be a better Batman. Eventually, the two of them work together to fight Hyena, Captain Nazi and Count Vertigo, villains Black Mask has sent after Jason. This partnership is short-lived when Jason kills Captain Nazi. All of this leads up to a final confrontation between Red Hood, Batman and Joker. Jason tells Bruce he forgives him for not saving him, but is angry that he let Joker live. The two of them have a deep conversation about morality and the nature of justice. Bruce says all he’s ever wanted to do is kill Joker but if he did, he wouldn’t be able to come back from it. Jason fires back with an emotional speech. Jason gives Bruce an ultimatum, saying he’ll have to shoot him in the face to stop him from killing Joker. Batman manages to disarm Jason with a batarang and Joker blows up the building. All of them manage to escape and Bruce is left scouring the ruins, much like he was when he held Jason’s body so many years ago. Winick is a master of storytelling, presenting Red Hood as a complex and sympathetic character. Loeb’s art is shadowy and suspensful, playing off the darkness of Gotham. 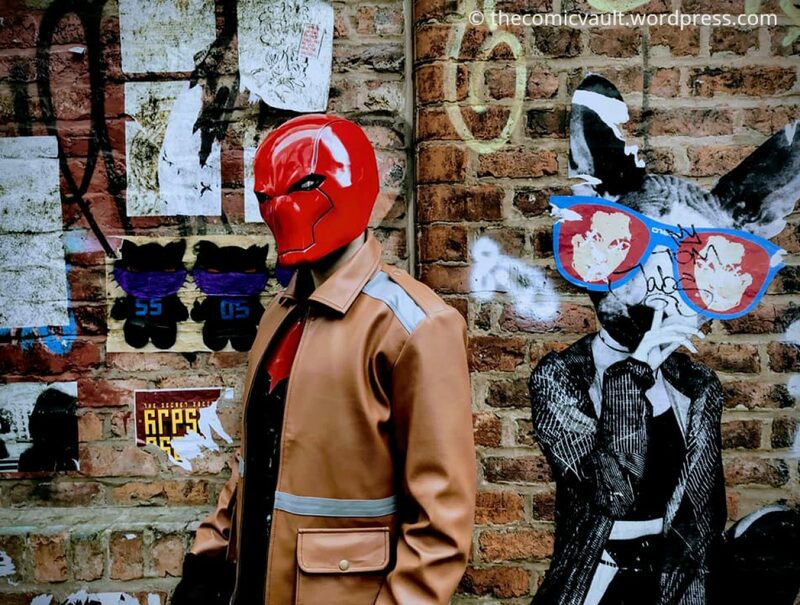 Under The Red Hood showcases themes of loss and morality. The lines between justice and vengeance are blurred and the distance between a father and son is established. Under The Red Hood is available here. Indeed. Back then writers really hadn’t defined Batman’s personality and they changed him over time. His no kill rule is the most obvious thing about him these days. From a modern stand point you could argue killing Joker would make the world a better place. But for telling stories it’s far more entertaining that he lives. Great review…adding to my TBR list! Glad you enjoyed it. It’s definitely worth reading! This particular comic was adapted into one of my favorite animated comic movies of all time. Haven’t had a chance to read the actual comic. Just got added to my to-do list though. The film and comic are equally as good so I could recommend the graphic novel enough.